DISCLAIMER: This post was written in 2012. Information may be out of date! 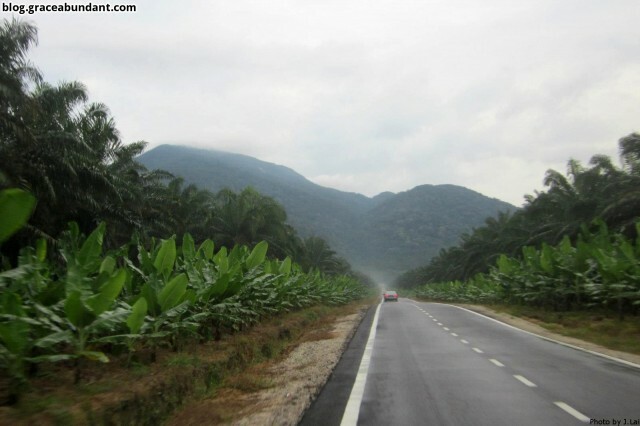 Location: Sagil, Tangkak, Johor, Malaysia. Start point: 2.34163N, 102.617293E 122m a.s.l. Summit: 2.373418N, 102.607976E 1276m a.s.l. Difficulty: Moderately hard. 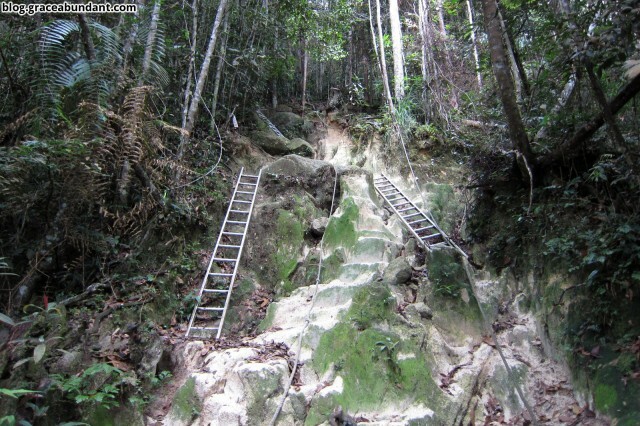 Varies from standard easy jungle trail (like Gasing Hill) to fairly steep sections, but climbing aids such as ropes & ladders are provided at difficult sections. 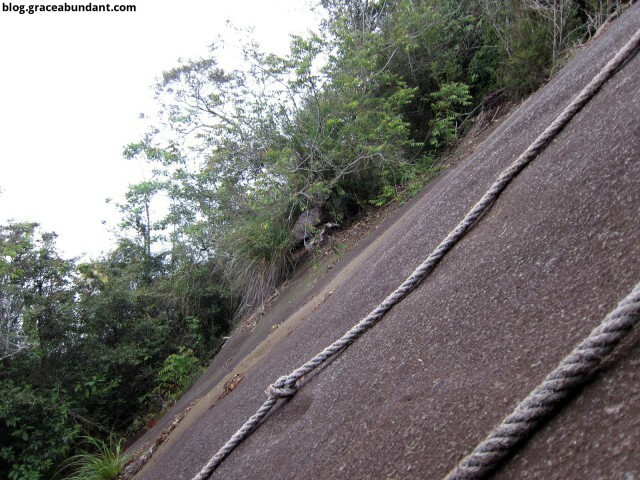 Involves some (rope aided) rock climbing sections. Unfortunately, one of the hardest parts of climbing Gunung Ledang is the cost involved – (as of September 2012) for a local, it costs RM27 for insurance and permits, and guides are compulsory at RM220 each, each taking up to 10 people. In other words, the cheapest you’d be able to climb it for (with 10 people) is RM39 per person. Of course, all this is excluding any transport fees. I was lucky enough to find a group which was climbing it with an optimal number of people, who handled all the bookings. (We were required to submit our names, contact, NRIC #, next of kin & contact). Along with 3 other friends from PJ, we headed down to Tangkak at 4am. (Most sane people would question why 4 people would do this on a Saturday when one could be sleeping in!) After meeting the rest of the group and eating breakfast at Tangkak, we headed to the registration & start point of Gunung Ledang. The road leading there is fairly new, and not yet marked on Google Maps. (If I remember correctly, the turn off is somewhere just after passing through Sagil) Facilities at the registration center are quite decent; there are bathrooms and dorms available, as well as drinks & food available for purchase. Before climbing Ledang, we were all required to fill in rubbish declaration forms, which would be checked upon our leaving. Even though the checking was not the most thorough, I think it’s a good thing in general – PLEASE always do not leave rubbish anywhere when you go climbing! Even though we were scheduled to begin climbing at 7.45am, we had to wait until 8am for the guides to arrive. After a short briefing, we set off on our ways at 8.26am. There are 8 checkpoints (CP) in total along the Lagenda trail which we took, although we skipped CP4 as it’s used by campers who stay overnight, and off the main trail. 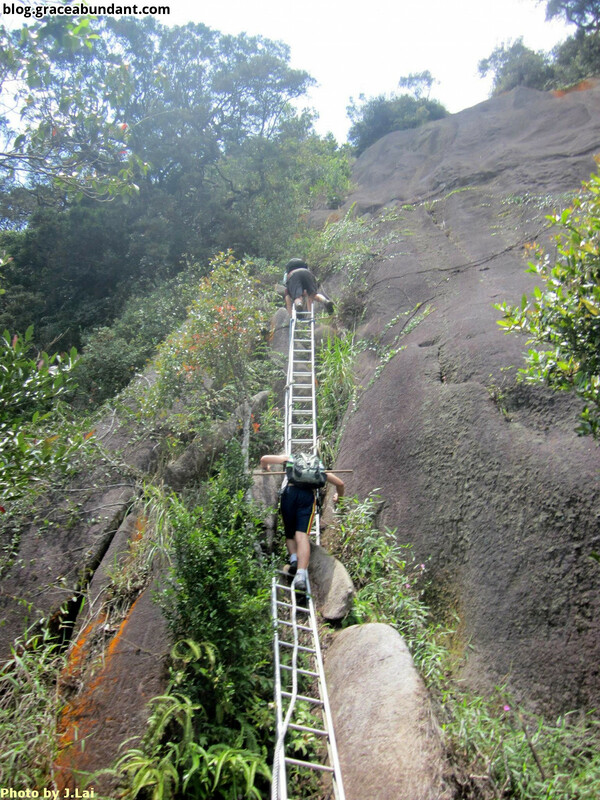 Between the start and CP1 (Bukit Semput) @ 263m were mostly concrete steps – a nice easy start (On this day, I decided to take things at a relaxed pace as I was still a bit tired from my Gunung Nuang climb). We reached CP1 at +00H:16M (8.42am), after which we were off concrete paths and onto standard jungle trails, which were nice and dry. 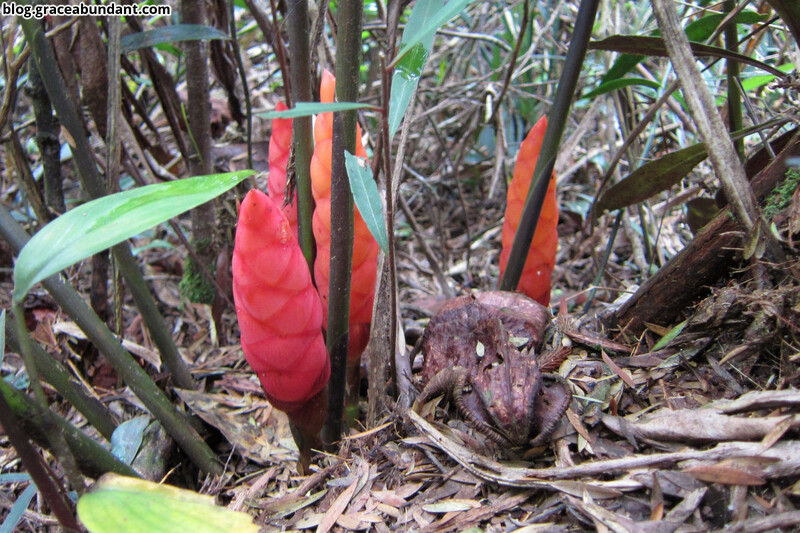 (Leeches are said to be few at Gunung Ledang – I did see one throughout the whole day, but no one got any bites). The trail is fairly easy up until CP5, with gradual climbs and a short descend just before CP5. We passed CP2 (Hentian Meranti) [363m] at +00H:30M (8.56am) and CP3 (Batu Orkid) [519m] at +00H:55M (9.21am). 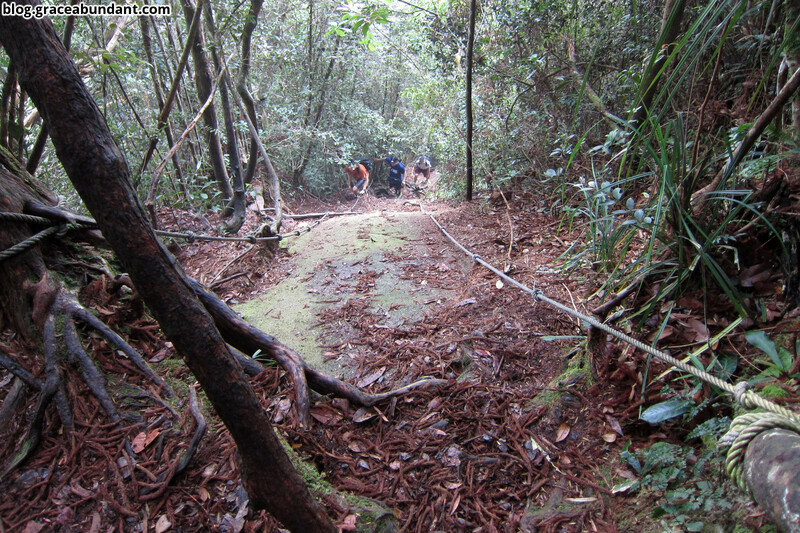 Since we were bypassing CP4, the trail between CP5 and CP5 took longer. We arrived at CP5 (Sungai Segi Tiga) [682m] at +02H:00M (10.26am), where we found lots of other people waiting around. There is a small stream at CP5 where you can refill your water (apparently drinkable), although I always recommend treating/filtering any water. Things got much steeper after CP5, where we hit the start of what is known as “KFC” – not the restaurant franchise, but the “Killer For Climbers” (or Killer Fitness Center) section. It’s actually not too bad, as ladders were provided at many sections, and we just adjusted our pace accordingly. 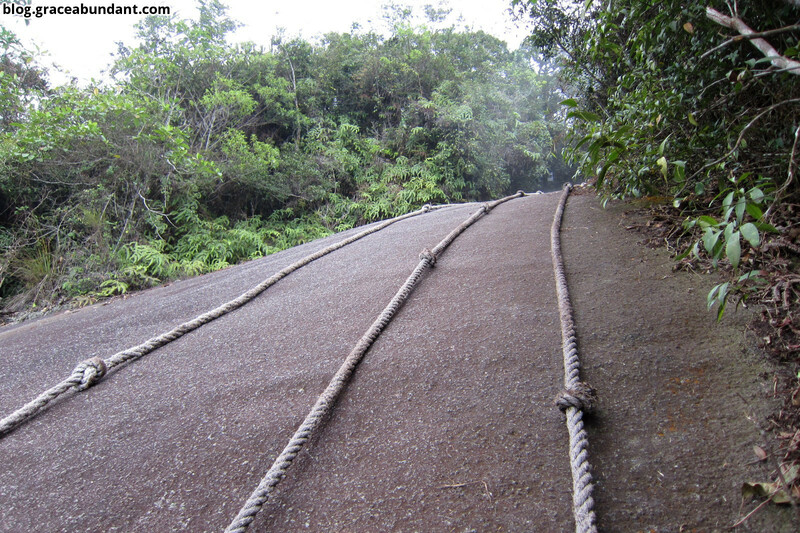 The steepness is similar to what you get at Saga Hill Route A. 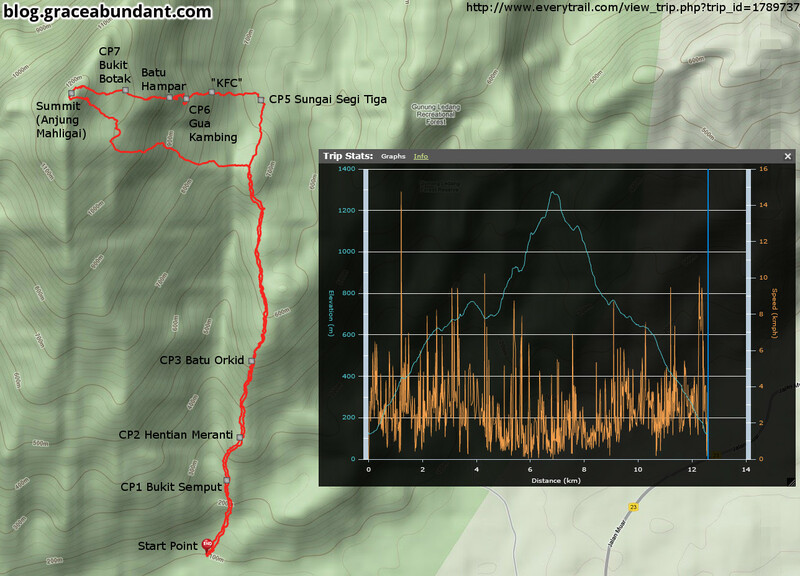 We arrived at CP6 (Gua Kambing) [877m] at +02H:48M (11.14am). 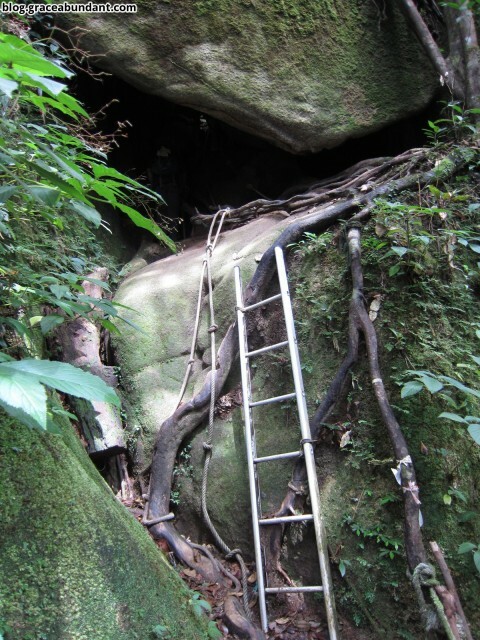 At this checkpoint, we had to climb through 2 small cave sections, which was easy enough given the ladders & ropes provided. If you’re the first to go through, you’d probably want to check for snakes or other creatures! 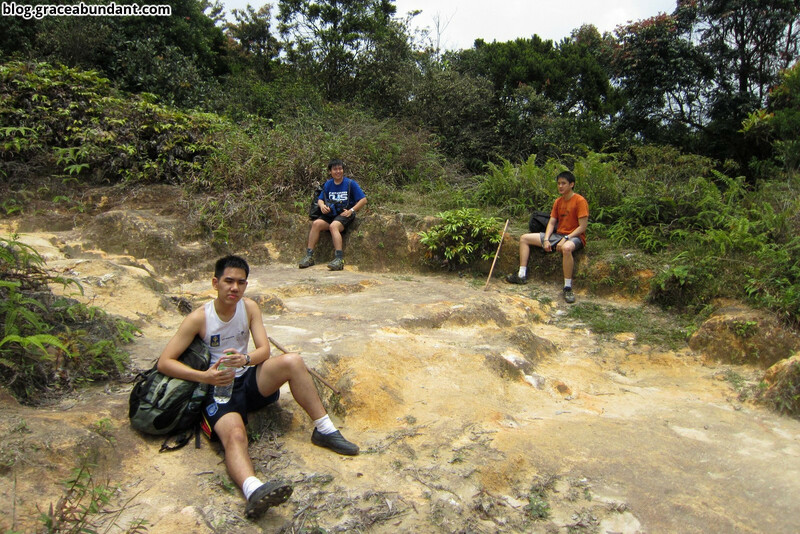 We headed on to the famous “Batu Hampar” (rock face) section, which we reached at +03H:18M (11.44am). This section consists of 3 ‘rocks’ with smooth faces at ~40-60 degrees. 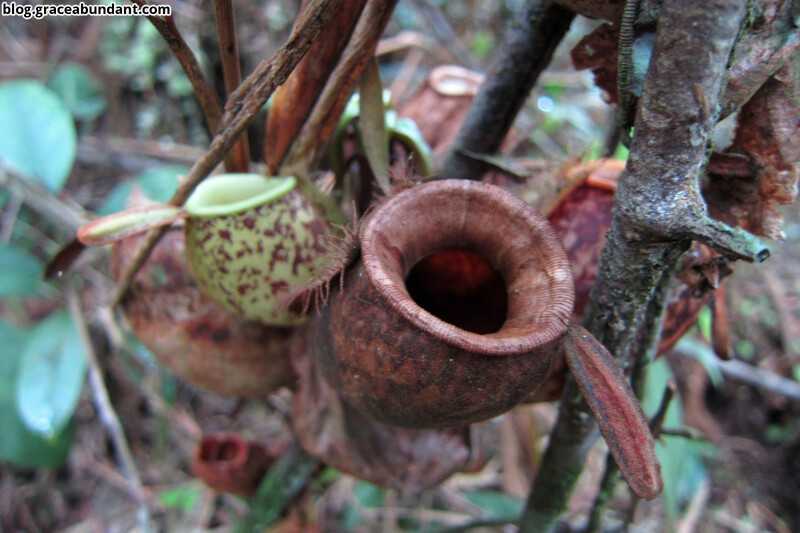 The first two are quite easy, and can also be climbed using the tree roots at their edges. The largest of the rocks is probably about 30m high, and is scaled using thick ropes. To be honest, it wasn’t that difficult. If you don’t have the strength, you just have to remember that you can stop halfway and take a break. From CP7, we descended a short way before making our way to the summit through a series of about 10 ladders. We finally emerged into the open and onto the top at +04H:44M (1.10pm). 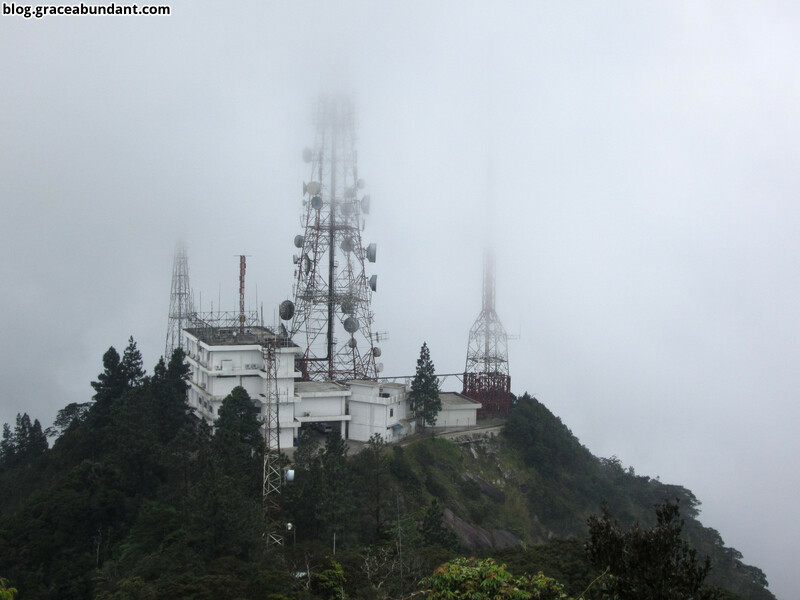 Being an isolated mountain, the summit provides pretty awesome views (unfortunately the weather wasn’t that clear), a bit like Gunung Datuk, except MUCH better. I’d recommend that you bring a hat just in case it’s hot at the summit. After sitting around for a while, admiring the views and eating our lunch, we headed down a different path (makes sense, otherwise there would be traffic jams at the ladders & ropes). The way down is along a different type of terrain with spongy ground (reminiscent of Gunung Bunga Buah near the rock garden), and we rejoined the main trail between CP3 and CP5. We finally reached the registration center at +08H:33M (4.54pm), where we sorted through our garbage forms, cleaned up, and headed back to PJ. 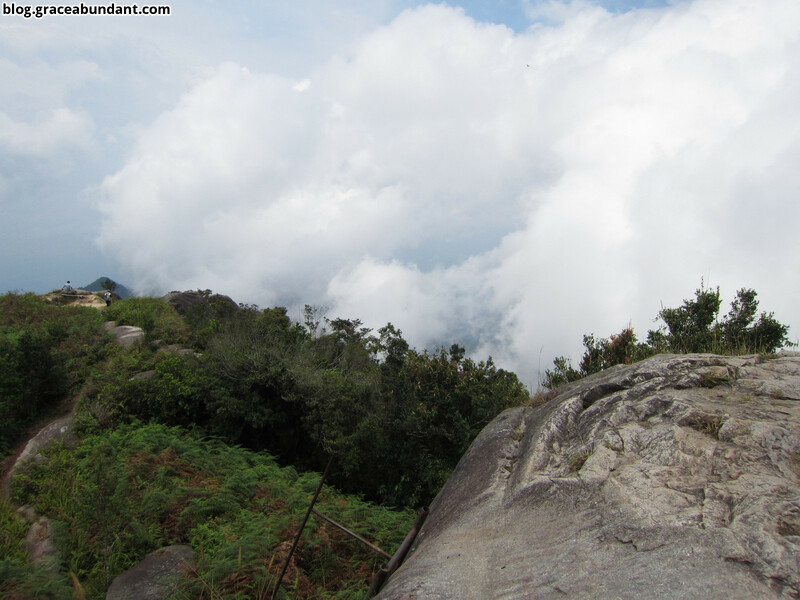 I have to say that while Gunung Ledang is not the hardest of mountains to climb (definitely easier than Nuang), it is one of the most interesting. I’d definitely recommend that everyone should climb it at least once, if you are able to swallow the costs. I met a few people along the way who have climbed it more than 30 times, and after my experience, it’s easy to see why. 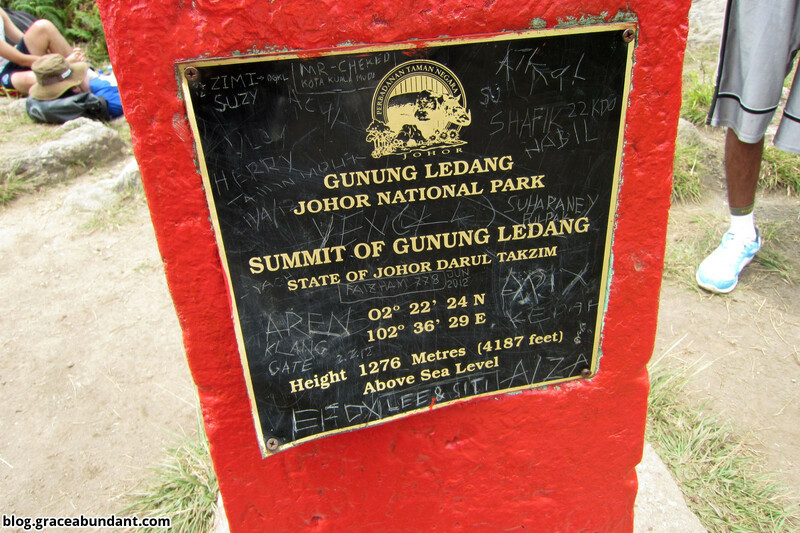 Gunung Ledang, the highest mountain in Johor, should take a person of average fitness (with regular exercise) less than 10 hours for a round trip. 2 stream crossings (CP5, and on the way down), both of which you can simple step across with shoes on. Rain protection is recommended for any electronic items or clothing. If you are prone to chaffing, apply vaseline/bodyglide/etc. as necessary. Emergency gear: flashlight, whistle, knife, lighter, 1st aid kit, etc. Optional: cap/hat, tarp/flysheet, cord/string, mat, water filter/tablets, etc. May I know the mobile contact and name for guide booking? Very nice of you to provide GPS coordinate and trail, thanks a lot! Nice of you to provide the information. 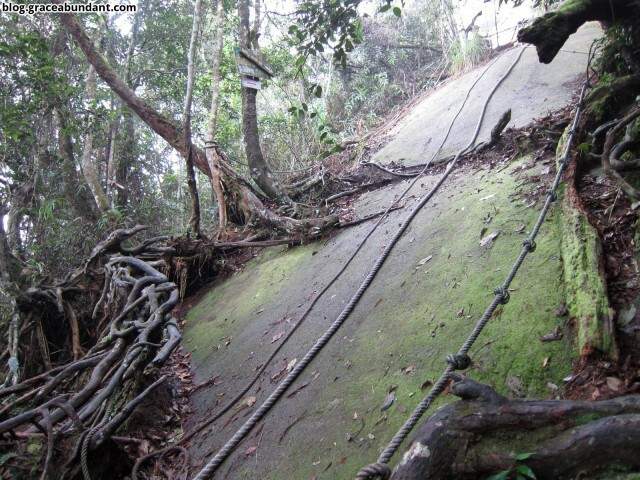 Just want to check whether is the old Ayer Panas trail which starts from the Gunung Ledang Resort and runs along the river is still in use or has it been closed and replaced by the Leganda trail? 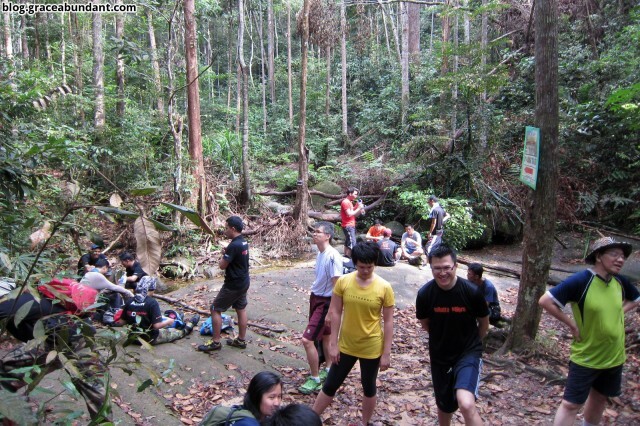 What’s the difficulty level for beginner/intermediate hiker. ?